There’s a popular trend in gaming going around, and it involves making games as difficult as feasibly possible, forcing the user to die and die again until they finally make a marginal amount of progress. You then repeat this process until you either complete the game (not likely) or watch your eyeballs explode in rage (not technically possible, but still more likely). Even more difficult to beat than pronounce, “Futuridium” has a story, but it basically boils down to you’ve been sent to a balls trippingly psychedelic universe where you are tasked with destroying a series of cubes to expose the main cube (called the core) which you then destroy to escape. Not exactly Pulitzer worthy, but it does give you a good enough setting for which to make runs over colorfully bizarre levels and destroy your objectives. The difficulty of this comes in small part through its tricky touch screen controls, but in larger part through your constantly depleting energy bar that only refills at the end of a level. It’s that bar that requires you to make pinpoint perfect runs, which isn’t made any easier by the having to start over at the very beginning of the game after each numerous failure, unless you earn the rare continue by hitting certain milestones. Like so many similar titles, the difficulty alone would usually be reason enough to never touch this game, if it weren’t for some genuinely enjoyable aspects. While the basic cube shooting is fondly reminiscent of many quarter sucking arcade classics, and at first glance you’ll likely get a serious “Starfox” vibe, really the game reminds me most of the cult classic shooter “Rez,” due to its mind altering visuals, and engaging soundtrack that begs for a good pair of headphones. Also like “Rez,” the combination of those aspects completely immerses you in the experience, which is particularly useful as the game requires a zen like state to complete. This is not a game for the casual player, and in fact it does at times feel slightly out of place on a mobile platform due to that. However, even the shortest play sessions can all contribute to building that perfect run, and that perfect run is sheer nirvana, even if you crash and burn on the next level. “Futuridium” is not a perfect app, nor is it intended for everyone. If you’re looking for a gauge of whether or not you will dig it, then ask yourself if an arcade game that will beat you down without mercy, and assault your senses with an enthralling soundtrack and unique visuals, while threatening your routine by causing you to miss train stops and phone calls as you contemplate the limits of your control issues sounds appealing. 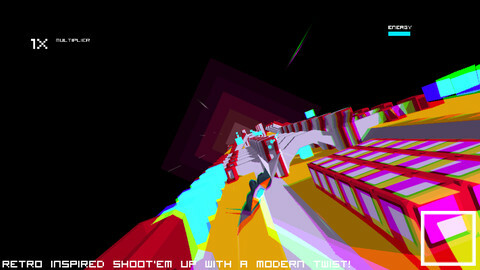 If so, then check out “Futuridium,” a truly trippy app of the week.